How do we know what is a GHOST? Are they Paranormal? How do we know what is a ghost? Are they paranormal? This is a question that has most likely been asked for hundreds if not thousands of years. There are many different beliefs that can be found in a myriad of cultures. Some cultures view ghosts as a bad thing while others embrace ghosts. Many books have been written about ghosts from quite a few different viewpoints. This discussion may last as long as humans can communicate or maybe one day the discussion will be settled with a definitive answer. There are vast numbers of individuals seeking such answers through research even though some individuals believe they already know the answer. For many the answers come from their culture or faith and believe as they do because this is what they were taught. Some thoughts have been that ghosts are not really ghosts but beings in another dimension and possibly a worm hole of sorts briefly opened and those beings or a look into that dimension becomes possible. Some may even think ghosts are not ghosts but beings from outer space. Then there are those too afraid to even discuss the thought of ghosts because their faith has taught them that all ghost are evil, occult and of the devil. 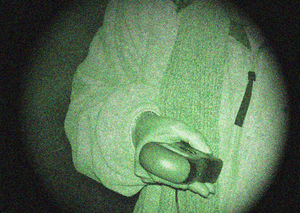 East Texas Paranormal (ETP) once had a case they shared with another group due to distance. This was a good case of paranormal unity between groups that led to help for a family who had never thought of the possibility of dealing with the unknown. Their entire family is Church of Christ and Sally (name of the client was changed to protect her and her family) called in frantic need of help not knowing what to do because what she claimed was happening to her family was shaking their belief system to its core. Some of the family members were so stringent in their beliefs that they think Catholics are still going to hell. Sally was advised she was talking to someone of the Catholic faith and that was fine by her, but she would not tell her family. Her claim was that something was attacking her young son and following him everywhere. She said doors would open and close for him as he entered and left a room. She said furniture would be moved around in him room and even in an entire house. He, we’ll call him Jason, went to stay with other family members during this time and Sally said it followed him there and now other family members were involved and witnessing strange events. Sally called and wanted immediate relief over the phone and to know what was happening. She learned that it doesn’t happen that way and someone could come to her home to help. Another group was contacted to help and help they did. Things quieted down around the households after several visits from the paranormal group. What was there? ETP and the other group are not sure, neither is Sally. Did it shake her families’ beliefs? You bet it did. They are still strong in their faith but was it a ghost? That is still unknown. Are there unexplained events occurring in the house? Yes they are and both groups are still in contact with Sally and will remain that way as long as needed. Unexplained events are ignored most of the time and no one in the family seeks counsel with whatever is there. You can read What to do if your house is haunted for additional information. Now, back to the main topic of what is a ghost. A search on Google will give you 457,000,000 results you can go through and read from now until the day you die. Many are fascinating while others seem just plain crazy. The difficult task would be learning to discern what is legitimate and what is not. Jason Sullivan explains What is a ghost on YouTube in a nine minute video. This is another place to observe many explanations of ghosts. So are you still confused as to what is a ghost? Aren’t most of us! Is there something about the paranormal you would like to see in an article? Whether it is something from within the paranormal community or of the unexplained it could be viable as an article. Contact the author with your idea and it may be the next topic of discussion. I think real ghosts often come back in the same place in order to show us what they want us to see. I think that’s the first and maybe the only evidence of ghost existence.